Legion Y720, which is the high-end version in the series featuring top notch hardware and features. With a 3W subwoofer from Dolby Atmos paired with 2W JBL speakers, Lenovo claims that the Legion Y720 excels in audio performance. The company also calls it as the “world’s first Dolby Atmos PC.” It is also VR-ready and certified to work with Oculus. Apart from VR, the gaming laptop also gets Xbox capabilities with optional integration of Xbox One wireless receiver add-on. It includes support to connect up to four controllers, thus allowing you to play multiplayer games with your friends. The laptop also comes with a backlight display with full RGB range of colors. Legion Y720 comes with a 15.6-inch full HD IPS display. There is also another variant featuring a higher resolution 4K IPS, anti-glare panel. Under the hood is Intel’s seventh gen (Kaby lake) Core i5-7300HQ processor paired with Nvidia’s GeForce GTW 1060 discrete graphics and 16GB of RAM. For those who want a faster processor, an option for Core i7-7700HQ is also present. On the storage front, you can get up to 2TB SATA HDD or choose up to 512GB PCIe SSD. Connectivity options include three USB 3.0 ports, a VGA port, an HDMI port, a DisplayPort and an audio jack. To keep things ticking is a 60Whr battery, which Lenovo claims to offer battery life of up to five hours on full charge. The Lenovo Legion Y720 price starts at $1,399 and will be available starting April 2017. 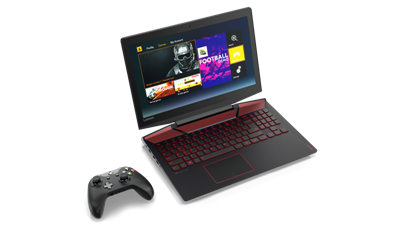 Legion Y520 is an affordable variant of the laptop targeted towards the casual gamers. It comes with watered down specifications and features. While it misses out on Dolby Atmos, it does come with Harman Kardon speakers. While it does come with a backlit keyboard, you only getcolor option. Talking about specifications, the laptop features a 15.6-inch full-HD (1080p) IPS display. You can choose between Intel’s latest seventh generation Kaby Lake Core i5 or Core i7 processors and NVIDIA GeForce GTX 1050 discrete graphics. However, other details are scarce at the moment. Prices for the Legion Y520 start at $899 and will be available from February 2017.